NASA is inspecting the space shuttle Discovery for damage from parts of a metal tool that fell during repair work at the spacecraft's Florida launch pad. The accident occurred late last night (Feb. 8) as technicians were working to replace a leaky seal on hydrogen gas vent on Discovery's external fuel tank at NASA's Kennedy Space Center in Cape Canaveral. Shuttle technicians were replacing the hydrogen vent seal on a catwalk high above Discovery's Launch Pad 39A when a tool known as a feeler gauge came apart. The tools are made up of 13 thin strips of metal — each as wide as a piece of paper — that are held together by a screw. NASA spokeswoman Candrea Thomas told SPACE.com that no one was injured by the falling metal strips. Shuttle workers inspected Discovery and its fuel tank overnight after the incident, then inspected the spacecraft again during daylight hours today (Feb. 9), she added. "They'll look at exactly every inch of the orbiter and the external tank to make sure it's safe and good to go for the Feb. 24 launch," Thomas said. Discovery's upcoming flight has been delayed for months, first due to a hydrogen gas leak and later because of fuel tank cracks that required lengthy repairs. Earlier this week, NASA decided to replace a hydrogen gas vent seal on Discovery's fuel tank for the second time after it failed a test. 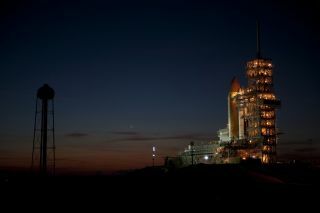 The STS-133 mission will be the final flight for Discovery before NASA retires its shuttle fleet later this year. The shuttle will deliver a new room and a humanoid robot to the International Space Station during the planned 11-day mission. Two spacewalks are planned. NASA plans to fly three final shuttle missions this year and then retire its reusable orbiters after 30 years of spaceflight. The shuttle Endeavour is scheduled to deliver a billion-dollar astrophysics experiment to the International Space Station in April. NASA also hopes to fly a third shuttle flight this year using the Atlantis orbiter to deliver cargo and large spare parts to the space station. That final mission, while approved by President Obama and Congress last year, has yet to receive final funding approval from a congressional appropriations committee. This story was updated on Feb. 11 at 5:50 p.m. EST to reflect the correct number of spacewalks.